✔High-speed : USB 2.0 flash drive for fast data transfer, storage for your games, photos, videos, music and other files. ✔Safe and reliable: With shock proof, magnet proof, temp proof, and X-ray proof, Supporting software encryption features, its data protection is valid for up to ten years. 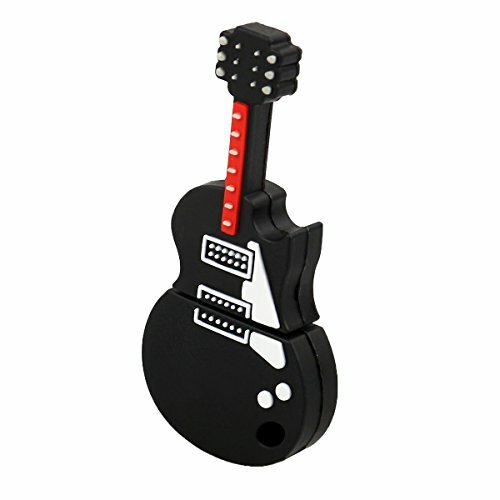 ✔Compact and Portable: Novelty music guitar design meets the current mobile products ultra- light, Compact and portable design. Its key ring can be used as a pendant necklace,Also Can be stored in your wallet or pocket.The use of advanced processing craft highlight elegant and fashion. ✔Operating System: Windows 7 / 8 / 98 / Me / 2000 / XP / Vista / Linux 2.4, Mac OS 9.0. ✔100% satisfaction Warranty: 12 months free warranty, 24 x 7 professional and efficient email support.